The new MT7500 Metallurgical Series is newly designed and features Infinity Corrected Optics for reflected light observation. Meiji Techno's ICOS™ (Infinity Corrected Optical System) with all new and improved Epi-Plan Optics provide outstanding crisp images and a superior flat field of view while delivering an excellent cost-to-performance ratio. These microscopes are ideal for metallurgical applications. The configured models below all feature SWF 10X eyepieces with a 22mm field of view. Configured formats are available with your choice of either a Siedentopf type binocular or trinocular body. The nosepiece is smooth operating ergonomic and quintuple. Plan Epi BD (brightfield-darkfield) 5x, 10x, 20x and 50x objectives are standard on the models listed. A ceramic coated stage with low positioned drop down controls makes for easy manipulation. The vertical illuminator is 12v 50 Koehler design with an auto voltage (110 - 240v), variable rheostat for brightfield, darkfield and simple polarizing and includes field iris, aperture iris with filter slots capable of brightfield or simple reflected polarization. Included are blue clear, green clear and neutral density filters in mounts. 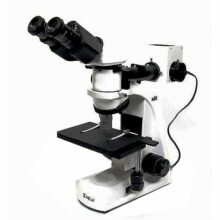 Click the button below to add the Meiji MT7500 Metallurgical Microscope Series - Brightfield/Darkfield to your wish list.